Not only does a messy house seem unsightly, but it may also feel cramped, small and even slightly depressing. Yet, tackling the mess isn’t always the easiest task unless you’re one of the experts for house cleaning in Carmel, Indiana. So, what should you do if you don’t know where or how to start cleaning a messy house? Cleaning your house greatly differs depending on whether you need to speed clean before your guests arrive or you’ve decided to clean it from top to bottom. Of course, if you hire professional help, your house will be clean at all times and you’ll have more opportunities to visit the Carmel Arts and Design District, dine in one of your favorite restaurants or spend time with your family. However, if you still haven’t handed your chores over to cleaning pros, you’ll need to deal with this task on your own. This might be stressful, especially if you’re on a tight schedule and need to clean your home quickly. Either way, you should come up with an efficient plan that will help you clean your home as much as possible during the free time you have. 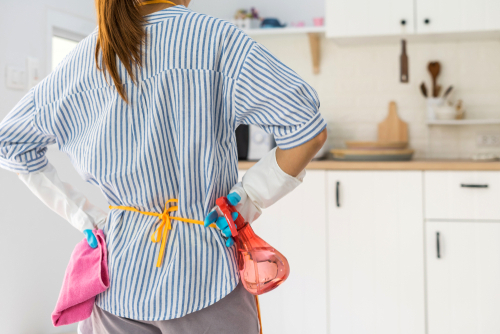 Whether you need to tidy up in an hour or you have an entire day at your disposal, you should avoid making some common cleaning mistakes for the best effect. How to start cleaning a messy house? Starting is often the most difficult part of cleaning, especially if you need to tackle a task that you don’t really enjoy doing. Although you might be discouraged by the mess and clutter, just imagine how your house will look like after a thorough clean-up. A simple way to trick yourself into cleaning is to put on a pair of shoes. This might sound silly, but this will help you trick your brain into elevating your energy levels. Since we usually put our shoes on when we’re going for a walk, leaving for work or completing some other chore, your brain will think that you’re ready for action and will respond accordingly. You should avoid wearing comfy shoes or slippers because they will make you want to cozy up, sit back and relax. How to make it more interesting? If you really don’t like cleaning or your cleaning crew is still not scheduled to come to your house, you can make this dreary task easier and more interesting. There are plenty of ways to make cleaning more fun and engaging. You can play some music from your favorite band and clean your home while listening to those amazing tunes. If you don’t want to sacrifice your workout for cleaning, you can just do both at the same time. A great number of people use this opportunity to clean and get their adrenaline running. If you make cleaning more enjoyable, starting and dealing with all the mess will be less of a bore. Where to begin cleaning a messy house? Once you get in the mood for cleaning, it’s finally time to start. But where? There are so many messy corners and cluttered areas that you don’t know which way to turn. Luckily, there are a few strategies that you can try and then decide on the one that works for you. Clean the urgent areas first. If you don’t have a lot of time to clean, you should definitely start with time-sensitive issues. For example, you should throw away spoiled food or deal with the most urgent and visible areas if you have guests coming over. Deal with difficult chores. If you have more time to devote to cleaning, you can tackle the most difficult tasks first. 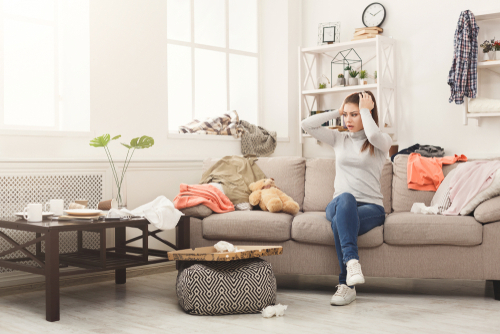 Dealing with the messiest and dirties areas in your home at the very beginning will get them out of your way and it will be easier to clean them while you still aren’t tired. Start with easy tasks. On the other hand, some people prefer doing easier tasks first because their homes will seem tidier right away and this can get them in the cleaning mood. Either way, you should tackle one room at a time because this will keep you more efficient and organized. How to deal with clutter? If you let clutter build up, it will make your cleaning job even more difficult. More importantly, clutter will gather dust, one of the most common household allergens, which can reduce your indoor air quality and affect your health. Decluttering your home will be quite easy if you adopt it as a habit. Instead of letting dishes, laundry and other items pile up, you can always return everything to its place and clean or wash an item after using it. As you go through different rooms, remove items that don’t belong there and put them in the right place. When it comes to sorting out your belongings, this can be a bit time-consuming if you haven’t done it in a while. However, if you adopt the right approach, you can make this task easier, too. When going through your items, you should get rid of those that you haven’t used in a year or more. Of course, you should also throw away all the broken items that can’t be reused. You might find it useful to sort your belongings into three piles: to donate, to keep and to throw away. How to get better at cleaning my house in Carmel? If you don’t like cleaning and you’re not really good at it, you’ll be glad to hear that you can change this. Cleaning is a matter of habit, so if you do it regularly or adopt a few efficient habits, you’ll find yourself getting better at this task day by day. Making your bed every day, washing your laundry regularly and prioritizing are just a few simple ways to clean your home more efficiently. However, if you have neither time nor desire to clean, you can leave it to the people who do – Deluxe Maid cleaning pros. We will help you clean your home to perfection without sacrificing your free time. Our Carmel, Indiana cleaning house cleaning services are faultless, so you can rest assured that your home will be spotless.